In Salem, Massachusetts in 1692, Puritan minister Reverend Parris finds a group of girls dancing naked in the forest. Among them are his niece Abigail and daughter Better, who faints upon being discovered by her father. Knowing that they've sinned, the girls claim they were bewitched. Given the severity of the claims, a special court is founded to investigate the accusations of witchcraft. Judges are sent from Boston to assist the residents of small town Salem. During the trials, the girls scream and faint whenever one of the supposed witches takes the stand. Over a hundred of Salem's citizens are found to be witches. One of them, Elizabeth Proctor, proclaims her innocence to her husband, John. Her accuser, Abigail, was once an employee and was dismissed after Elizabeth discovered that John and Abigail were having an affair. Realizing that Abigail has incited this witch hunt to target her enemies, John fights to save his wife. He admits his adultery, only to be accused of devil worship when Abigail denies the affair. John and Elizabeth are convicted of communing with the devil. The pregnant Elizabeth is spared, but John is hanged. The Crucible takes place in Salem, Massachusetts, in 1692 during the Salem witch trials. The play is a fictionalized version of the trials and tells the story of a group of young Salem women who falsely accuse other villagers of witchcraft. The accusations and ensuing trials push the village into a hysteria which results in the arrest of 200 villagers and the deaths of 19. The play was written by American playwright Arthur Miller, who was wrongly accused of communism and un-American activities during McCarthyism in the 1950s. Miller wrote the play as an allegory, revealing the political and moral parallels between the Salem witch trials and the McCarthy trials of his own time. The play opens in the house of Reverend Samuel Parris, who has just caught his daughter Betty, his niece, Abigail, and his slave, Tituba, dancing naked in the woods. Betty is lying unconscious on the bed. Villagers have gathered at Parris’s house because they suspect that the girls were performing witchcraft in the woods. Parris questions Abigail, who says they were only dancing. She threatens the other girls into telling the same story. Parris tries to calm the crowd and tells them that he called for Reverend John Hale, an expert on possession and witchcraft. Betty wakes up momentarily and tries to jump from the window. John Proctor, a Salem farmer, arrives at Parris’s house. Proctor pulls Abigail aside to ask her about what happened. Their conversation reveals that Abigail and Proctor had an affair while she was working at his house. Abigail says that she and the other girls did not perform witchcraft. In truth, they were trying to curse Proctor’s wife, Elizabeth. Abigail wants to curse Elizabeth because she is still in love with Proctor. She believes that he loves her in return, despite his insistent claims to the contrary. Their argument is cut short when Betty wakes up screaming. Parris run into Betty’s room, followed by fellow villagers Rebecca Nurse and Ann and Thomas Putnam. Thomas, Parris, and Proctor launch into an argument about money and land ownership. Reverend Hale soon arrives to examine Betty, and Proctor leaves. Ann Putnam, who has lost several children, thinks Betty’s condition is due to witchcraft. In contrast, Rebecca Nurse thinks a doctor should be called. Hale pulls Abigail aside to question her and, under the pressure, she says Tituba forced her to drink blood. Hale and Parris then question Tituba about what they were doing in the woods. Tituba says she was doing the devil’s work and then accuses several women from the village of using witchcraft on her. Abigail joins Tituba in making accusations. As the two name Sarah Osborne, Bridget Bishop, and Sarah Good for practicing witchcraft, Betty wakes up and joins them. In a frantic spectacle, the three of them accuse yet more women of witchcraft while Hale calls for the named women to be arrested and judged. Act II opens in John and Elizabeth Proctor’s house. They are talking about the villagers who were arrested because of Abigail and the girls’ accusations. Elizabeth, who knows of John’s affair with Abigail, wants him to expose Abigail’s lies, but he refuses. She accuses him of continuing to love Abigail. As their argument continues, Mary Warren, a friend of Abigail’s and a servant to the Proctors, enters. She gives Elizabeth a puppet she made during Elizabeth’s trial, which she has just attended in town. She asks Mary to tell her who accused Elizabeth of witchcraft, because she suspects—correctly—that it was Abigail. Mary says she doesn’t know and goes to her room. Reverend Hale arrives and tells the Proctors that he is talking with everyone accused of witchcraft. Hale suspects that the Proctors are not devout Christians because he has heard reports that they don’t go to church often. John says that his dispute with Parris, the Reverend of the village’s church, is the reason for their frequent absences. Elizabeth gets irritated when Hale starts questioning her and asks him to question Abigail first. Before Hale leaves, John tells Hale that Abigail’s accusations are not true. Hale reminds John that many people admitted to their crimes and John tells him that they were forced to do so; otherwise, they would be hanged. Hale is unconvinced but admits that John has a point. Just as Hale is about to leave, Francis Nurse, Rebecca Nurse’s husband, arrives with Giles Corey to tell the Proctors that their wives have been accused of witchcraft and arrested. Soon two men arrive with a warrant to arrest Elizabeth. John tries to defend his wife. The men see the puppet Mary gave Elizabeth on the desk and remark on the pin attached to its midsection. They tell John that Abigail was ill last night and that a pin was found in her stomach. She accused Elizabeth of cursing her with a puppet. John calls for Mary to explain. Mary insists that she was the one who made the puppet and inserted the pin, and Abigail was there while she did so. But the men are unconvinced and believe that Mary is lying for her employers’ sake. Despite John’s efforts, Elizabeth is arrested. John gets angry and challenges Hale to say why everyone believes Abigail and the girls’ accusations when there is proof that they are telling lies. Hale fails to answer and says maybe they are all paying for a sin that no one knows of. This makes John think of his affair with Abigail but he does not say anything. Hale leaves, and John calls for Mary. He commands her to come with him to court so she can help him convince the court that the accusations cast by Abigail and the girls are untrue. Mary repeatedly refuses but eventually obeys. She tells him that if they try to expose Abigail’s lies, Abigail won’t be afraid to reveal their affair to save herself. John is worried but believes that saving the accused is more important than saving his reputation. Thus, he decides to take the risk and unmask Abigail’s lies. Act III begins at court in Salem. John and Mary arrive as Giles and Francis, whose wives are accused of witchcraft, disrupt the court’s proceedings to try to prove their wives’ innocence. They are thrown out by the court. John goes to speak with Judge Hathorne and tells him that Abigail and the girls are lying. He gives Hathorne a deposition signed by the villagers that vouches for the good characters of Elizabeth, Rebecca, and Martha. To dissuade John from presenting the deposition in court, Judge Hathorne tells John that Elizabeth is pregnant and will be spared until the birth. John, who did not know of his wife’s pregnancy, is shocked but still chooses to submit the deposition. Parris, who has a feud with John, and Judge Hathorne refuse John’s appeal, making Reverend Hale suspicious. He questions why Parris and Hathorne are refusing to consider the defense of the accused when both sides——defense and prosecution—should be equally attended to in court. Governor Danforth tells Hale that the defense cannot be trusted when witchcraft is involved, because the defense may be bewitched by the accused. Danforth then commands everyone who signed the deposition to be questioned. A fight about land ownership ensues. Giles Corey presents a deposition of his own. Corey’s deposition contains eye-witness accounts of numerous villagers. These accounts claim that Thomas Putnam sought to frame Martha Corey as a witch in order to gain control of Corey lands. But Corey refuses to divulge the identities of his sources, because he is afraid that they will be arrested as well. As a result, Governor Danforth asks him to be arrested for trying to lie to the court. The proceedings start and John brings Mary forward and tells the court that Abigail forced Mary to lie. Abigail denies the claims and accuses Mary of bewitching the girls. Angered by her behavior, John tells the court that he and Abigail had an affair and that Abigail is accusing Elizabeth out of jealousy. But when Elizabeth, who does not know of John’s confession, is asked about the claims of adultery, she lies to protect John. Abigail and the girls start shouting and throwing furniture around, claiming that Mary is now bewitching them. Mary, who is both confused and afraid of getting hanged, starts crying and blames John of forcing her to testify against the girls. John gets furious and berates the court. The judges order for John to be arrested. Reverend Hale is shocked by the court’s wrongdoings and leaves. As act IV begins, the village is devastated by the trials and their aftermath. Two hundred villagers have been accused, and the vast majority have confessed to the charges levied against them in order to avoid execution. Twelve of the accused refused to confess and thus were hanged, and seven more—including John Proctor and Rebecca Nurse—remain silent and thus await the gallows. The lands of the confessors are now in the hands of the government. The rumors of uproar in nearby villages makes Abigail anxious. She steals Parris’s money and runs away to England. Reverend Hale feels guilty for having participated in the trials, and he returns to Salem. He asks Danforth to let the remaining seven accused, including John Proctor and Rebecca Nurse, be released with confessions. Danforth refuses. Elizabeth visits John to convince him to confess to avoid hanging. John asks about the others accused, and Elizabeth tells him that Giles Corey refused to confess and was pressed to death. John still doesn’t want to but eventually agrees to confess. He immediately regrets his decision after signing the confession and rips apart the paper. John is hanged with others, and the play ends with Elizabeth witnessing their deaths. Although Elizabeth is full of grief, she expresses her admiration for the moral steadfastness of those who refused to confess. Analyze what a good name means to some of the characters in The Crucible. What are the main conflicts in The Crucible and why? In The Crucible, what are some quotes that show Abigail Williams is selfish and manipulative? 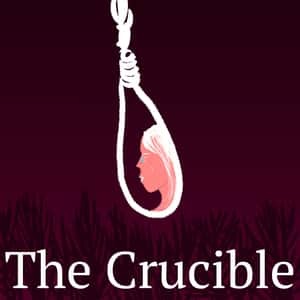 What are some examples of Abigail Williams being a liar and being cruel in The Crucible?